Contour Cut Foam - Foam Contour Cutting Service | Foamcraft USA, LLC. Foamcraft USA offers contour cutting services, which cuts patterns automatically. 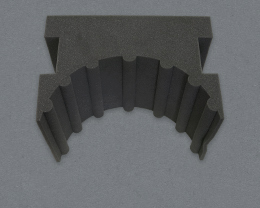 Contour cutting allows a user to create intricate shapes of foam with low tooling costs. Before machinery was built to do this automatically, foam blocks were cut by hand using a paper, wood, or hand drawn “pattern” to cut the perimeter of any custom shape. With modern technology, our computer controlled machines cut large blocks of foam into nested parts, obtaining the maximum available yields possible and ensuring the lowest cost per piece. Once these parts are cut to the proper size, the depth of the contour cut foam part can then be slit to the desired thickness. Our two machines offer great versatility as one is a vertical machine achieving the maximum heights of 44” and our horizontal machine can fabricate up to 80” thus ensuring the best yield for your contour cut foam. We can also cut inserts with one or more cavities that are “eye” cut. The blade enters the inner area and cuts out the desired cavity and retreats back on the same path. Parts cut in this way can have a dovetail joint type of closure mechanism built in at no charge. This exemplifies die cutting with no tooling and lower piece costs. At Foamcraft, we can custom contour cut polyurethane foams to meet your unique specifications. Contact us today for more information on foam contour cutting services.